WordProser is ad-supported software that promises to make searching and translating information easy. It is just enough to highlight the text and this program will show you Wikipedia and Bing results in an in-page window. Even though it seems to work as promised, WordProser has some drawbacks as well. The researchers of pcthreat.com have found out that this application might display various deals and coupons when you visit online stores. On top of that, it might show various pop-ups and other kinds of ads on different websites. It has been found out that advertisements might not allow you use your computer freely. In addition, they might disrupt your browsing session. Therefore, we highly recommend that you stop them from appearing. The only way to do that is to delete WordProser from the system. You will be able to do that without any difficulties because this suspicious application can be easily removed via Control Panel. The program acts very similarly as QuickKnowledge, TermTutor, and Highlightly; thus, there is no doubt that it will bombard your Internet Explorer, Google Chrome, and Mozilla Firefox with various commercials. According to our security experts, ads might take you to unreliable websites because nobody knows whether reliable links are embedded into them; thus, it is advisable to be cautious. The risk of infecting the system with malware will be there unless you erase WordProser from the system. Thus, we recommend doing that as soon as possible. As other advertising-supported applications, WordProser might enter the system with a help of other unreliable programs. Thus, if this adware has appeared on your system out of nowhere, you should also check whether there are no other unwanted programs on your computer. In case you detect them, you should delete them together with WordProser because they might cause you a great deal of inconvenience as well. In order not to encounter similar suspicious programs in the future, you should definitely install an antimalware tool on the system and keep it enabled 24/7. 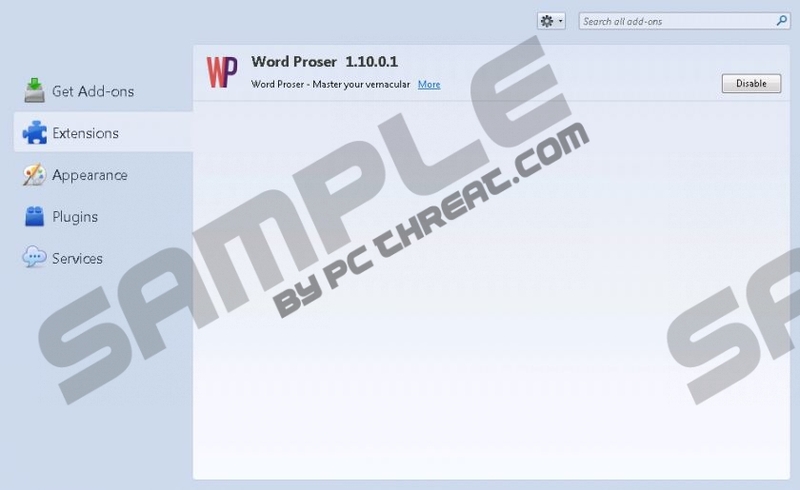 It is not worth keeping WordProser even if seems extremely beneficial because this program might take you to the websites full of malicious software. Our manual removal instructions will help you to eliminate this adware without any difficulties; however, you should still not forget to check the condition of your system because other infections might hide on your system as well. We recommend using SpyHunter scanner for this matter. Select the suspicious application and click Remove. Tap the Windows key and start typing Control Panel. Click on its icon to open it. Select the unwanted program and then click Uninstall. Quick & tested solution for WordProser removal.